I need some advice guys! Hi, I am 26 years old and live in the U.K. I currently wear a hair unit and have done for the past 3 years. I am now strongly considering a hair transplant for various reasons. One of them being that the unit involves a lot of maintenance, a lot more than I think I anticipated before having it done. Don’t get me wrong, its been great too as it has boosted my confidence and now I am really struggling coming to terms with shaving my hair off completely to have a transplant. The second reason is that I am moving to Barcelona in August and I know that the heat will drive me crazy, so I know it’s time now that I get something permanent. 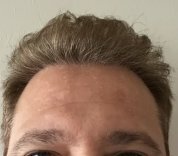 I have tried taking propecia whilst wearing the unit but that didn’t seem to work, and I have also tried the laser therapy for over a year prior to going down the non-surgical route of wearing a unit, this also didn’t work. I have looked at various options and I think I’d prefer the FUT transplant as I like to shave my hair on the sides and I wouldn’t want a visible scar. I have looked at various clinics too and the prices here in the U.K. are so much more expensive. I was convinced going to Turkey to have the procedure done would be fine until someone said but what if something goes wrong, then I’d have to travel abroad again etc, which has kind of put me off. I have attached some pictures of my hair without the unit, so you can see where I’m at with my hair loss now. The hair is there but it’s very thin on top. Any recommendation of clinics would be greatly appreciated, as would any comments and general advice as something I feel incredibly down about it all. Thanks guys, if you have any further questions. Don’t hesitate to comment. Hi guys, I'm in desperate need of some advice. Hair Unit to ... ?